Leading Manufacturer of fromm fsw13 pallet wrapping machine, fr3xx robot stretch wrapping machine, fromm fs33x budget stretch wrapping machines, fromm fs31x budget stretch wrapping machine, fromm fs110 stretch wrapping machine and fromm fs130 stretch wrapping machine from Ahmedabad. The Fromm FSW13 Semi Automatic Pallet Wrapping Machine was designed to be a simple & efficient machine for wrapping 10-40 pallets per day. Similar to the FSW-10, we have stripped out unnecessary functions from this machine, allowing it to do what it does best (stretch & wrap) at the lowest possible price point. Unlike the FSW-10, this machine comes fitted with a powered pre-stretch head, which stretches the film around a pallet, both increasing load security & significantly reducing film usage. The FSW 13 is a real film miser. 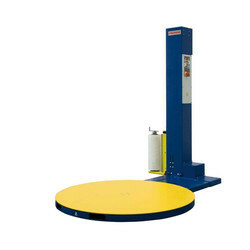 The FSW-13 Fromm stretch wrapping machine is a great step in automatic wrapping. It’s pre-stretch system delivers film savings and load security. From 10 - 40 pallets per day the FSW-13 is simple to operate and very functional. For best results we recommend our range of high performance machine stretch films, talk to our friendly staff today. All equipment is supported by our on-site mobile service team and spare parts if needed are readily available. Machine functions adjustable on the easy to operate control panel. FROMM stretch wrappers are extremely user-friendly and can be used in every situation. The FS33x, in particular, is highly suited to use by smaller-scale film users. Extra emphasis was placed during the design stage on safety and reliability. All the machines are designed to cope with a high workload. The use of carefully selected components keeps maintenance to a minimum. FROMM stretch wrappers are extremely user-friendly and can be used in every situation. The FS31x, in particular, is highly suited to use by smaller-scale film users.Extra emphasis was placed during the design stage on safety and reliability. All the machines are designed to cope with a high workload. The use of carefully selected components keeps maintenance to a minimum. 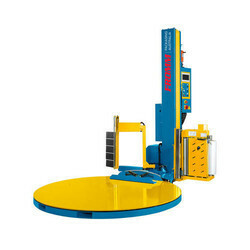 The wrapper FS110 "Cento" is a reliable machine entry for a user who needs to shoot a few pallets quickly, thoroughly and at an affordable price. Built inThe simplicity of connection "plug and play" allows you to install this machine without additional cost. Built-in standard (CE), this wrapper semi-automatic low price is ideal for the packaging of your small volumes in the palette. The simplicity of our Plug & Play design allows you to start wrapping with no installation costs. No special training is required by an operator to be able to operate the stretch wrapper. This FS series offers continuity for your dispatch. Built up to a standard not down to a price“This low-profile, semi-automatic stretch wrapper is ideal for low volume Wrapping which eliminates hand wrapping.